The first episode of “The Hour” has a murder, and although we don’t know the characters involved in the struggle, this sets the tone for the remainder of the miniseries. Even as the characters become clearer, the mystery must be unfolded over the course of the six-episode series. The way that this truth is revealed is what makes “The Hour” so captivating, bringing us into the world of hard-hitting journalism during a time when that could very well be considered treason by some. Set in London during 1956 at the Lime Grove Studios, the series follows the beginning of the new BBC news show called “The Hour.” This show is the culmination of the efforts of many, though there are three seen as the main driving force. Freddie Lyon (Ben Wishaw) is a brilliant journalist with the fearless ability to search for the truth at his own risk. Freddie’s insistence that journalism should not be censored by the government often gets him into trouble, though he has the support of his best friend and producer, Bel Rowley (Romala Garai). These two are paired with the connected and handsome Hector Madden (Dominic West), who becomes the front man for the television show while also becoming romantically involved with Bel. This seems to upset both Hector’s wife and Freddie, but the news remains the priority for all. 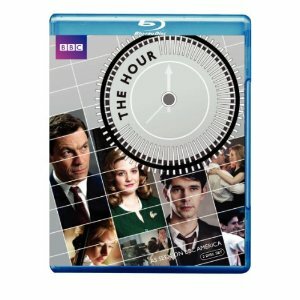 “The Hour” builds tension over six episodes, all of which are fit onto this two-disc Blu-ray set. The conspiracy unfolds as events in the nation cause an upheaval amongst citizens and politicians alike. There is urgency to the material which can only be found in real history, and the series is only enhanced further by an enigmatic cast. The Blu-ray special features include a making-of featurette, specifically looking at the creation of the set piece, as well as some behind-the-scenes footage.